Awaking this morning to the tragic news of a terrorist attack on a mosque in Christchurch, New Zealand, I am stunned, once again to understand what motivates such a horrific act of human and spirit destruction. 49 dead. . . 20 critically injured. . . children, elders, women, men. We are all part of the human fabric, b'tzelem Elohim, created in the Divine image, regardless of religion, race, geography, social status. In this spirit, I ask you to join me in signing a campaign letter to send Love & Solidarity to the Muslim Families of New Zealand: Pledge to Fight White Nationalism. 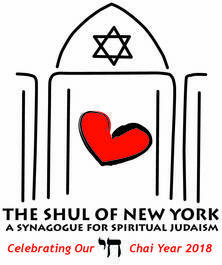 If you are inclined to offer tzedakah, you may do so here. As we enter Shabbat, may we each take a moment of silence to pray for those across the globe who were so brutally killed while in prayer at the Mosque and their families. If you haven't made plans to do so yet, please join your Shul of New York community this evening for a very special Shabbat in honor of Women's Herstory Month. We celebrate the voices of women in our community and join in prayer for global peace, love and compassion.